So make sure to come back to this spot between 10 PM – 11 PM ET for our Designated Survivor recap. While you wait for our recap make sure to check out all our Designated Survivor recaps, spoilers, news & more! 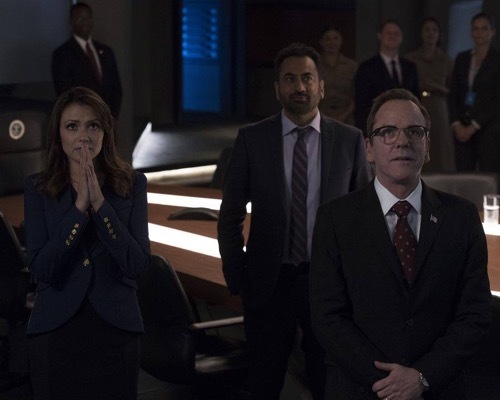 Tonight’s Designated Survivor recap begins now – Refresh Page often to get the most current updates! The team and the president watch negative press footage of him threatening the first lady’s killer. They all try to come up with a game plan on how to deal with it. Meanwhile, a group of people are taking a tour of the White House. One woman asks if they are in the east wing. They tell her yes. They all sit down, protesting. Lyor catches wind and comes to see them. They are being handcuffed by security. Lyor stops them. He tells the people to go on with their protest. He catches up with Seth and Emily, telling them that arresting the protesters would only make the president look more like a monster. Tom and Kendra meet with the board of one of Alex’s causes. Tom shakes hands with a man who he seems to be uncomfortable with. He introduces Kendra to him, it is his brother. Tom meets with the leader of the protester. She is from the Ochio tribe who was relocated years again and now again. She comes to see Tom now because he was the young architect who was responsible for displacing them the first time. Tom welcomes Billy, a former architect colleague who was his first hire, into the office. He meets Emily. They discuss the Ochio people. Aaron and Hannah continue to question Damian. They are still trying to find out who hacked the missile. Damian gives up his handler. Hanna meets her in a park and asks her if she would like to ppol their resources. She is willing to cooperate if they return Damian. Hanna isn’t willing to do that. Tom meets with the tribe leader and the developer. He tries to mediate a land swap, but neither party wants to agree. Lyor and Emily talk in the hall as they look at the protestors. Meanwhile, Tom’s brother is making the trustees board meeting difficult. Lyor, Seth and Emily watch the bad press of the Ochio leader on the news. They need Tom to fix this. Emily meets with Tom and Kendra. They try to figure out what they plan to do. Kendra reports to Tom that his brother is holding up Alex’s wishes. Tom pulls his brother aside. His brother admits he is holding up the process in order to gain time with him. Tom thinks he is difficult and self centered. They talk about the past. Tom is still angry Trey took off and left him behind to care for their sick mother. He asks his brother to sign off on Alex’s wishes and leave. Lyor cannot stop wondering what one of the young men from the tribe is writing about on his computer. He goes up to him. He is writing a college essay and for the same college Lyor attended. Lyor is very interested and starts to give him tips on topics. Tom meets with Billy and tells him the $20 million settlement is not going to be the answer. Trey hangs out with his nephew. Leo asks him to stick around. He needs to deal with the issues he has with Tom. Meanwhile, Lyor continues to tutor the young man on how he needs to approach his essay with more flare. Hanna brings Damian to the place he will be staying. He tells her he really did care about her. She doesn’t care. Trisha finds an old letter that was sent to Tom long ago. Billy hid it so that they could take on the contract. They needed the money. Tom is upset. He dismisses Billy after hearing a handful of excuses. Tom thinks about something the tribal leader says about a treaty. After some research, he saves the people’s land. Lyor reads the young man’s final draft and is thrilled. Damian goes downstairs in the dark to get something. Someone is waiting for him. Hanna comes out of nowhere and shoots the person. Chuck has uncovered a connection between Damian and the hacker. Chuck is ready to shut down his computer and bring his findings to the FBI when his computer lights on fire. The hacker set it to overheat. Leo asks Tom about him and his brother’s relationship. Leo gives Tom a speech about family, one Tom cannot agree with. Tom holds a press conference apologizing to the people for his out of line threat to Alex’s killer. After his speech, Tom meets with Trey to apologize to him. Trey admits that he couldn’t live up to being Tom’s brother. So he was bad. He isn’t going to run anymore though. They will get through it together. The next day they visit Alex’s grave together.